What goes great with a cup of coffee? Don't you dare say cigarettes. I was thinking more along the lines of a bagel. Now, you can get bagels just about anywhere these days. But do you want to know where you can get some of the best bagels in RI? 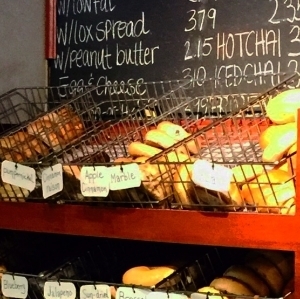 They have more than a dozen varieties of made-fresh-on-the-premises-daily bagels. From plain (for all you traditionalists ) to everything else you could possibly dream of, including: everything, onion, pumpernickel, blueberry, cinnamon sugar or chocolate chip. Besides bagels and coffee, you can find delicious chai, sandwiches or (if you're craving veggies) salads there too. Nicole, her bf and Chris (Brianna's bf) also literally could NOT stop talking about all the different delicious cream cheese options like veggie or chive or (again if you're diehard traditional) plain yesterday. I've never heard people rave about cream cheese so much in my entire life. I swear. So, we're talking about Cafe International. Kind of a huge deal, no? It's definitely a Cranston Hot Spot. 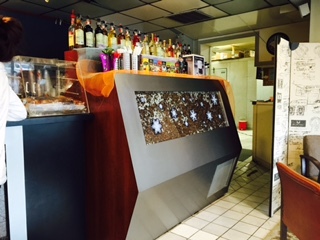 Where you'll probably find lots of the Cranston Glitterati. 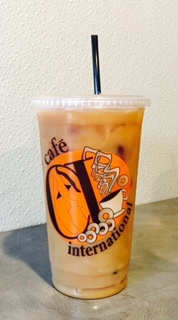 Find Cafe International at 675 Oaklawn Avenue, Cranston, RI, on FB. and on Belly, the app that long story short, helps you earn points by checking in and Points = Rewards.